Do you eat emotionally? After a stressful workday or a fight with your teenager, do you turn to potato chips, ice cream or chocolate cake to feel better? If you eat (or drink) emotionally, you are not alone. 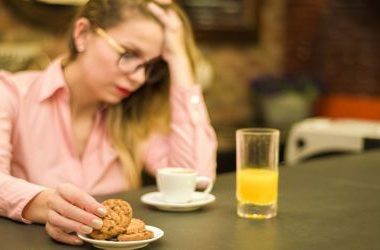 According to the American Psychological Association’s Stress in America survey, 38 percent of adults report overeating because of stress and roughly half of these adults engage in stress eating at least weekly. Emotional eating occurs when a person uses food to sooth the negative feelings caused by the stresses and hassles of daily life. Coping with negative emotions through eating may contribute to significant weight gain as well as common obesity-related ailments like high blood pressure, diabetes and heart disease. One reason we turn to food to sooth our negative emotions may be related to how our brain evolved thousands of years ago. There are around 90 billion neurons in your brain, all of which are used to produce thoughts, regulate physiological functions, access memory, and so much more. To understand why we eat emotionally, we must first understand how our brain drives thoughts, which lead to feelings, actions and inevitably our results. Our thoughts and the resulting actions may be the outcome of thoughtful consideration or fear-based instinct. For simplicity, psychologists sometimes refer to these two ways of responding as the rational brain and primitive brain. The rational brain manages executive function, which includes our ability to think critically, plan, define goals and predict outcomes. In comparison, the primitive brain is the seat of emotion and is important for survival instincts, such as fight or flight and mating. The problem is our primitive brain is wired for the way we lived thousands of years ago when human beings faced life or death situations daily, such as outrunning predators and food scarcity. Our primitive brain helped us stay alive by warning us about danger, ensuring we recognized a potential threat, or encouraging us to eat when food was available. Even though we haven’t been chased by deadly beasts in many centuries and food is abundantly available, our brains haven’t evolved and the primitive brain still functions on this level. Thousands of years ago, dopamine was essential to motivate us to search for food. Today, however, food is not scarce. Additionally, highly-processed foods with added sugar are extremely common because of their addictive nature. While foods high in fat and protein cause moderate dopamine release, foods high in sugar (even naturally occurring sugar like in fruit) spike dopamine levels. This means that foods high in sugar cause more dopamine to be released and, consequently, more feelings of pleasure and reward. Feelings of pleasure and reward that motivate us to repeat the same behavior – eating more food. Since dopamine makes us feel good and eating foods high in sugar, such as chocolate cake and ice cream, releases large amount of dopamine, it’s easy to see why we turn to these foods during times of stress. We seek to sooth our negative emotions by stimulating dopamine production. It’s how our brain is wired from thousands of years ago. The key to changing this behavior is (1) recognizing our negative emotions or thoughts, (2) not allowing our primitive brain to dictate our actions, and (3) having an action plan so we can respond in a more constructive and healthful way. If you’re struggling with emotional eating or other destructive behaviors impacting your health and wellness, a life and weight coach could help you. Delane Vaughn, MD, is a certified Weight and Life Coach specializing in helping clients achieve greater health, wellness and quality of life through thought work and lifestyle modification. Call (316) 619-8365 or e-mail Delane@DelaneMD.com to set up a time for a mini-session with me. It’s an easy and free way for you to get to know my work and get some good information and strategies for dealing with any of the obstacles that stand between you and your goals.